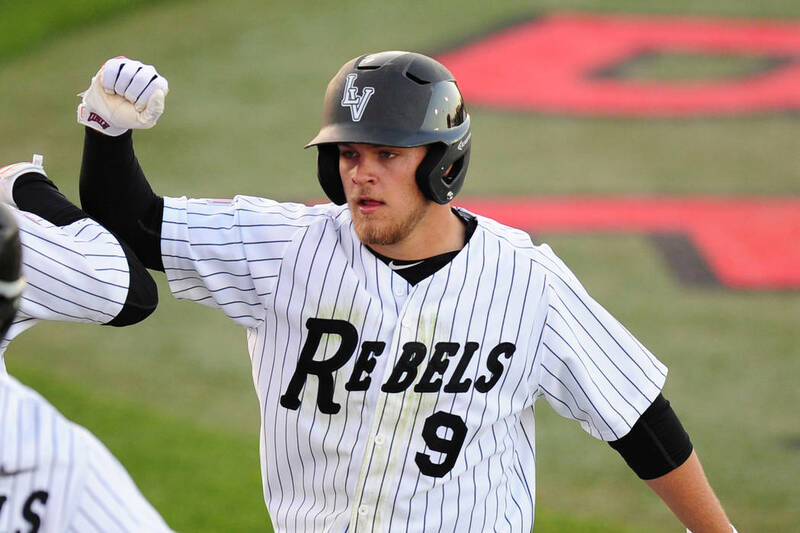 Max Smith went 3-for-3 with two home runs and five RBIs to back strong pitching by Ryan Hare and lead UNLV past UNR 8-5 in a Mountain West baseball game Saturday at Wilson Stadium. Hare (3-2) held the Wolf Pack (11-10, 3-5) to one run on two hits and one walk over six innings, striking out four. Smith hit a solo homer in the second, a two-out three-run shot in the third and an RBI single in a three-run fifth for the Rebels (14-10, 4-4). Dillan Shrum hit a two-run homer in the eighth and Tyler Bosetti a two-run shot in the ninth off UNLV reliever Paul Richy, who exited with no outs in the ninth. Conner Woods pitched a perfect final inning for his first save, notching one strikeout. Vince Taormina went 2-for-4 with a two-run single in the fifth, and Jack-Thomas Wold went 2-for-5 and scored twice for the Rebels, who held an 11-6 edge in hits in their third straight win. Weston Hatten went 3-for-4 with a double, an RBI and a run for UNR. At Logan, Utah, Justine Federe and Mia Trejo each homered and drove in four runs apiece to lead the Rebels to a 12-0 win over Utah State. In the Mountain West doubleheader’s second game, Lexi Orozco hit a go-ahead three-run double in the fifth inning to lift the Aggies to a 4-3 victory. In the opener, Federe went 2-for-2 and scored three runs, Trejo went 3-for-4 with a double and scored twice, Samantha Diaz went 3-for-3 with two RBIs, Reina Bondi went 2-for-2 with a double and scored four runs, and Lauren Tycksen went 2-for-4 with an RBI triple and scored twice for UNLV (22-7, 3-2), which held a 14-2 edge in hits. Rebels starter Jenny Bressler allowed one hit and no walks and struck out five over three shutout innings. Orozco went 2-for-2, accounting for both hits by Utah State (11-14, 2-3). In the second game, Bondi opened the scoring with an RBI single in the third. After Ryann Holmes’ RBI double tied it in the fourth, the Rebels went up 3-1 on a two-run single in the fifth by Trejo, who finished 2-for-3. The Aggies went ahead to stay on Orozco’s bases-clearing hit in the fifth. Stepha Reed went 2-for-3 and scored a run for Utah State, which held a 7-6 edge in hits. Bressler (14-3) allowed four runs, three earned, on seven hits and three walks and struck out five over 5 1/3 innings. Aggies starter Kapri Toone (2-5) went the distance, giving up three runs on six hits and five walks while striking out five. At Tucson, Ariz., sophomore Polly Mack shot a 5-under-par 67 for a 7-under 137 total to take the Mountain View Invitational lead by one stroke and put the Rebels in second place, four shots behind Texas State, after two rounds of the three-round, 13-team event. Texas State is at 13-under 563, followed by UNLV (567) and Iowa State (568). Washington and Oregon State are tied for fourth at 572. For the Rebels, senior Shannon Oh is tied for 13th in the 77-player event at 2-under 142, freshman Veronica Joels is tied for 24th at even-par 144, sophomore Cathy Liu is tied for 38th at 3-over 147, and senior Elizabeth Prior is tied for 57th at 7-over 151. Senior Alyssa Getty, competing as an individual, is tied for 69th at 12-over 156. At Fertitta Tennis Complex, Izumi Asano, Anna Bogoslavets and Connie Li each won in singles and were part of a doubles victory to lead the Rebels (10-6) to a 7-0 rout over Texas-San Antonio (10-10). Asano won 6-4, 7-5 at No. 2 singles and teamed with Bogoslavets for a 6-3 victory at No. 3 doubles. Bogoslavets won 3-6, 7-5, 7-5 at No. 4 singles. Li won 7-5, 4-6, 1-0 (10-8) at No. 6 singles and teamed with Samantha Li for a 6-2 victory at No. 2 doubles. Aiwen Zhu won 5-7, 6-3, 1-0 (10-5) at No. 1 singles, En-Pei Huang won 6-2, 7-5 at No. 3 singles, and Jovana Kenic won 7-6, 6-1 at No. 5 singles as UNLV halted a two-match skid and improved to 8-2 at home. At Riverside, Calif., the Rebels had six victories and 23 total top-eight finishes on the final day of the nine-team UC Riverside Spring Classic. Jonon Young won the triple jump with a 40-foot, 6.25-inch effort, Avi’Tal Wilson-Perteete won the 1,500-meter run in 4 minutes, 25.57 seconds, Mackenna Howard won the shot put with a 52-foot, 1-inch throw, Taylor Pegram won the 100 hurdles in 13.65 seconds, and UNLV’s 400 relay and 1,600 relay teams also were victorious. The Rebels competed against Azusa Pacific, California Baptist, Cal State Fullerton, Cal State Los Angeles, Sacramento State, UC Irvine, UC Riverside and Utah Valley.